Attention Woofers Parents - Please help save a life! The bloodbank saved my life. Help me save other lives. A personal challenge close to my heart. Kabey is the inspiration to opening Woofs and she is the dog on our logo. Forever in my heart and in my thoughts. 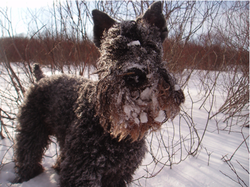 My Kerry Blue Terrier Kabey, Enjoyed 8 more great years after she received 2 blood transfusions. Please join us and help other dogs. √ If female, spayed & no previous litters. All they ask is you bring your dog once every 3 months to donate a pint to help save a life. It takes 15 minutes of your time once every 3 months. Thank you to our own Aunties for supporting the blood bank. A hug and kiss to Molly and Oscar as each time they donate they save multiple lives. The CABB has informed us that they are in need of donors as many of their long-term donors are retiring this year. To register please download the following form at: CABB Canine Registration Forms. To contact them to find a location close to your home please call (204) 632-2586. Thank you to anyone who joins me to save a life.